Just admit it: Deep down inside, the kid in you really wants to know who would win a fight among the Avengers. You’ve debated it, maybe even dreamed about it, and probably have spent more time wondering if Captain America’s shield could withstand a blast from Iron Man or if Black Widow could tame the Black Panther than you’d like to acknowledge. Would Hawkeye’s arrows make a difference? Would the Scarlet Witch’s spells prove too much for War Machine’s sheer power? And what about Falcon? And what would happen if you threw Spider-Man and Ant-Man into the mix? Questions first posed on the pages of comic books are finally answered on the big screen, where Captain America: Civil War sheds light on which hero would reign supreme in a fantasy free-for-all. Like all fights, Civil War forces you to choose a side. After a few of the Avengers’ bad judgment leads to the loss of innocent lives while trying to foil a robbery in Lagos, the horde of heroes are faced with an ultimatum: They must answer to the United Nations, who will deploy them only when needed. No more going rogue – unless they want to spend their days behind bars. Tony Stark (Robert Downey Jr.) goes from Iron Man to Iron Mensch by saying the Avengers need oversight, as do Black Widow (Scarlett Johansson), War Marchine (Don Cheadle), Black Panther (Chadwick Boseman) and Vision (Paul Bettany). But not Captain America (Chris Evans) or his buddies Falcon (Anthony Mackie), Hawkeye (Jeremy Renner) and Scarlet Witch (Elizabeth Olsen), who don’t want to be told when and where they can flex their muscles. The rift between Team Cap and Team Iron Man leads leads to an epic battle at a German airport that’s as powerful as a wrecking ball and has more explosions than the Fourth of July as the Civil War plays out for 15 glorious minutes. But film isn’t all braun and no brains. 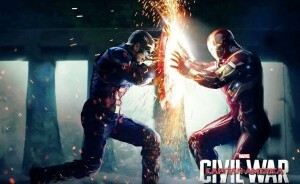 Unlike previous Avengers’ films that are fueled by fighting, Civil War goes where no superhero movie in the Marvel Cinematic Universe (MCU) has ever ventured. Pick your franchise: Iron Man, Thor, Incredible Hulk, Spider-Man, or the Avengers. They’re all mostly vanilla with a few toppings. 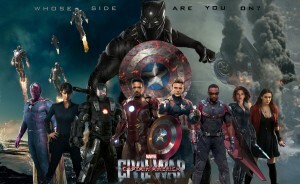 But Civil War integrates the MCU, as it’s the genre’s first film to feature three African-American heroes – Black Panther, Falcon and War Machine – among a cast of more than a dozen comic-book characters. Whether its Captain America trying to destroy those who turned his buddy Bucky Barnes (Sebastian Stan) into the sinister Winter Soldier or Iron Man and Black Panther trying to avenge their parents’ deaths, there’s plenty of story lines to break up a plot dominated by fighting. But directors Joe and Anthony Russo make sure the heroes don’t fight over screen time, as they all get their moment to shine. This is no small feat, considering both Avengers movies suffered from characters fighting for screen time, leading to some messy scenes. But still, the fighting is what will make Civil War a juggernaut at the box office. The scenes are exquisite, as characters remain true to their combat styles. And don’t get caught up in the method behind the madness. Who cares why the Black Widow chose to be on Iron Man’s team despite having been romantically involved with Captain America? And does it matter whose side Spider-Man (Tom Holland) and Ant Man (Paul Rudd) chose? If there’s one knock on Civil War, it’s that not everyone was invited to the party. For some reason, the Incredible Hulk and Thor, who were in the first two Avengers movies and have franchises of their own, are absent. Maybe Thor was too busy chasing Loki and the Hulk was taking anger management counseling. Their absence simply can’t go unnoticed. However, Thor’s and Hulk’s most glaring weakness – their inability to engage the audience verbally – would have been exposed in a film with witty dialogue by Captain America, Falcon, Iron Man and Spider-Man that provides a welcome comedic break. It will be no laughing matter what Civil War does at the box office. Though technically it’s the third Captain America film – the first two films collectively generated $1.08 billion at the worldwide box office – it feels more like the third Avengers movie. The first two Avengers film each placed in the top seven at all-time box office, collectively taking home nearly $3 billion. With that much money at stake, there’s no way this war ends without a sequel.